ConvertAnyFile Toolbar is an application that Mindspark Interactive Network has designed to help Windows users with the conversion of different files. This program is represented as an add-on for Chrome, Firefox, and Internet Explorer browsers, and, once installed, it provides links to sites that are supposed to convert files. Unfortunately, this toolbar is not as innocent as you might believe it to be at first. There are a few reasons why computer users remove ConvertAnyFile Toolbar from their operating systems, and we will discuss them in this report. Most computer users delete ConvertAnyFile Toolbar because they identify this add-on as useless and annoying. Even though it is possible to install this program from convertanyfile.com, many acquire it bundled with malicious software. We are sure that there is no need to explain why you must delete malware from your operating system ASAP. Keep in mind that the infections associated with the suspicious ConvertAnyFile Toolbar could be concealed, which might make their removal much more complicated. If you are struggling with the detection of computer infections, install a reliable malware scanner, and we suggest using an automated malware remover to delete all threats. In some cases, ConvertAnyFile Toolbar comes bundled with other Mindspark toolbars. CoolPopularGames Toolbar, FreeLocalWeather Toolbar, and GardeningEnthusiast Toolbar are just a few of the add-ons that you might find installed along with ConvertAnyFile Toolbar. Needless to say, having multiple toolbars occupying your screen space can be quite irritating, especially if you do not know how to delete them, or if you installed them by accident. Ask Search is another piece of software that computer users often install by accident. This search tool is always offered along with ConvertAnyFile Toolbar, and some users install it unintentionally. This might be the reason why some users mistake the toolbar for a browser hijacker. Besides coming bundled with unfamiliar software, promoting search tools that show sponsored links, and presenting links to third-party sites, ConvertAnyFile Toolbar also installs tracking cookies to spy on its users. Not all cookies are malicious and intrusive, but some could record information you might want to keep to yourself. Unfortunately, it is often difficult to say which cookies are malicious, which is why we strongly suggest trusting automated malware removal software to delete them. Of course, authentic software will recommend removing ConvertAnyFile Toolbar and all other unreliable programs as well. 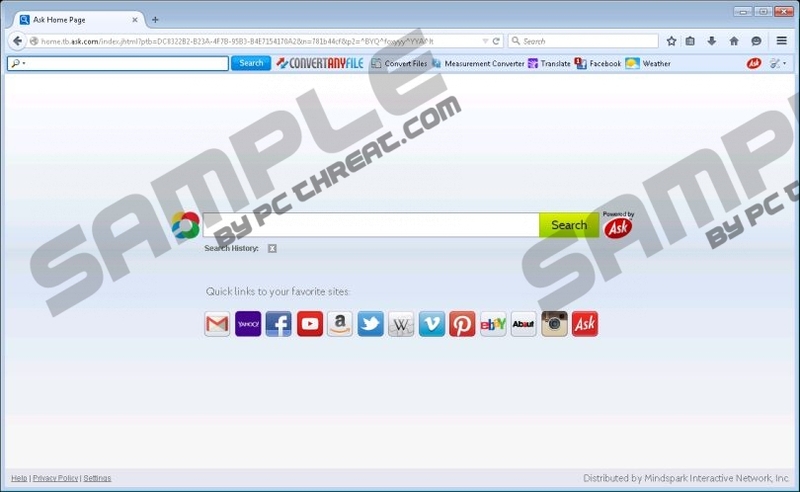 If you are not happy about the search tools and browsers extensions installed on your PC, we recommend removing them. If you follow our tips, you will delete ConvertAnyFile Toolbar and Ask Search from your browsers in no time. Uninstall ConvertAnyFile Toolbar from Windows to delete it from Internet Explorer, and move to the add-on managers in Chrome and Firefox to delete ConvertAnyFile Toolbar from these web browsers. Our manual removal guide also shows how to remove Ask Search. Immediately after this, employ a trustworthy security tool to protect your Windows operating system and maybe delete leftover infections. Right-click ConvertAnyFile and select Uninstall to delete it. Remove the undesirable search tool and click Close. Simultaneously tap Alt+T again and click Internet Options. Remove/overwrite the URL, click OK, and restart IE. Open Firefox and simultaneously tap Alt+T. Remove/overwrite the undesirable Home Page URL. Simultaneously tap Ctrl+Shift+A (Add-ons Manager). Go to Extensions and Remove the undesirable add-on. Click the trash icon next to the unwanted add-on and click Remove. Go to On Startup and mark Open a specific page or set of pages. Click Set pages and remove/overwrite the undesirable URL. Click OK.
Navigate to the Appearance section and mark Show Home button. Click Change and remove/overwrite the undesirable URL. Click OK. Remove the undesirable search tool, click Done, and restart Chrome. Quick & tested solution for ConvertAnyFile Toolbar removal.